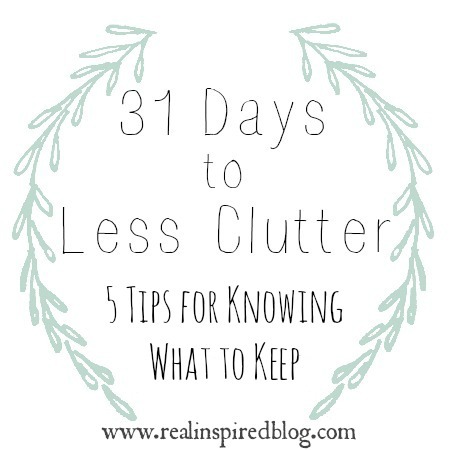 So now that we've let go of our clutter, how do we know what to keep? 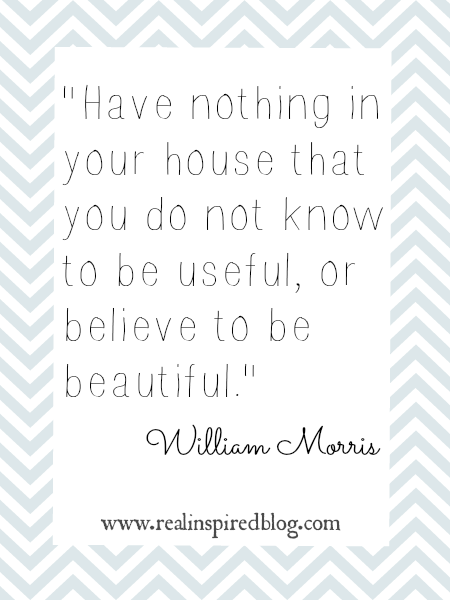 I've been going around the house purging like a crazy person and I have a few guidelines that I'm going by. Because you know I'd never go so far as to call them rules. I'm a rebel like that. 1. Has it been used in the past year? If you're aren't currently using it, it probably isn't something you love or need. Seasonal decorations don't come out but once a year and there may be an extra set of dishes that you keep put away for when you have visitors. There are some things I'm keeping that I'm not using yet but I know I will once I tweak it. Or once I've decluttered and made some space for it. If you have it you should be using it! 2. Is it in good shape? Some things have just seen better days. Pillows flatten, dishes chip and scratch, and fabrics become threadbare and stained. Some things are just out of date or your personal style has changed. If it's something you really want to keep for sentimental reasons, look into having it restored or reupholstered so you can actually use it. Or find a unique way to display it so it can bring you happiness even in it's shabby state. If it's something that's needed(like towels) but you can't afford to replace them yet, keep a list of items to replace and gradually work through it, replacing things as you can. For example, I have an awesome navy blue cardigan that I love but it isn't good quality. I am wearing it out because I wear it all the time. It goes on my list of things to look for while I keep wearing it as is. Once I find a replacement, I'll get rid of it. 3. Does it serve a purpose? Pretty easy, right? I don't automatically throw something out if it doesn't have an apparent purpose. Some purposes are obvious. The bed is for sleeping, the vase is for flowers, the basket is supposed to be for holding the remotes. The not so obvious purpose is enriching your life. Does it accomplish that purpose? I know it is super hard to get rid of things, especially things that have been with us for many years and have many memories attached to them. There is a time to keep those things that aren't our favorite aesthetically simply because they have real meaning to us. I have a few things that have been passed down through my family that I want to keep even though it might not be "me." Except it is me because those things have become a part of me and my family's story. Those things become a part of your story too. I really want to talk about every gift from every friend, every coworker, every family member. Do you really need every single one? Keep your favorites(that you love and that have real meaning) and give the other things a new home with someone who will love them. Don't let that stuff clutter your home or your attic. 5. Do I love it? A lot of the stuff that I'm getting rid of is stuff I do like. I just don't love it. I don't get giddy happy when I see it. It doesn't make my life better. This is where I'm trying to get! This quote is one of my absolute favorites and it sums it all up so well. Keep what you know is useful. Keep what you believe is beautiful.